THE prospect of the environment is looking great for Malaysia with the recent announcement by the government during the mid-term review of the 11th Malaysia Plan. MITIGATING impacts and risks of climate change and disasters. All targets and strategies have been aligned to the United Nations’ Sustainable Development Goals, and one of the key new targets announced was the introduction of a new environmental protection law to give more teeth to enforcers and pool resources across agencies. We’ve never actually never had any powerful law to protect the environment and natural resources in a holistic integrated manner. There are existing piecemeal laws and regulations, but with too many gaps and loopholes in the enforcement. Due to the lack in integrated legal protection, the most affected (and neglected) habitats and ecosystems are our wetlands — both on the terrestrial and coastal zones. This is clearly reflected in the quality of our rivers, lakes and peat swamps, as well as the declining state of our mangroves, seagrasses and other coastal and marine wetlands. The key impacts on our wetlands were driven by land-use change, and the polluting effluence that came mainly from agriculture, mining, logging, industry and urban developments. All of these mentioned activities and drivers were monitored, controlled and enforced by different departments or agencies with a different set of legal tools and priorities. Thus, holistic conservation objectives were hard to achieve. Naturally, mangroves and all other wetlands play an important function as kidneys in the natural landscapes. Mangroves, in particular, are able to filter nutrient and sediment transported from the upstream through the rivers and channels before being flushed into the sea. They also act as a sponge to absorb water that otherwise, in excess, would cause floods. These are the key ecological points that need to be understood by managers when tackling coastal land-use and municipality issues. The occurrence of mangroves in the intertidal zones is significant to minimise the impacts from tides, waves and winds to the land. The tall, dense and steady trees of the forested coastal wetlands naturally form a barrier or a buffer to protect coastal villages and communities, in addition to providing other vital ecosystem services. There are minimum requirements for mangroves as an ecosystem to perform these various functions, and there are also limits from disturbances that mangroves can tolerate, and this is the classic negligence — a complicating scenario induced by human interference on the natural systems. The impacts from anthropogenic disturbances usually exceed the threshold limits implicating not only the ecosystem, but also the surrounding landscapes and communities. Compounding effects from anthropogenic disturbances with extreme disasters would cause the impacts to be amplified. Marine debris (particularly plastic litter) is an essential example of an issue to be tackled by this proposed comprehensive environmental law. 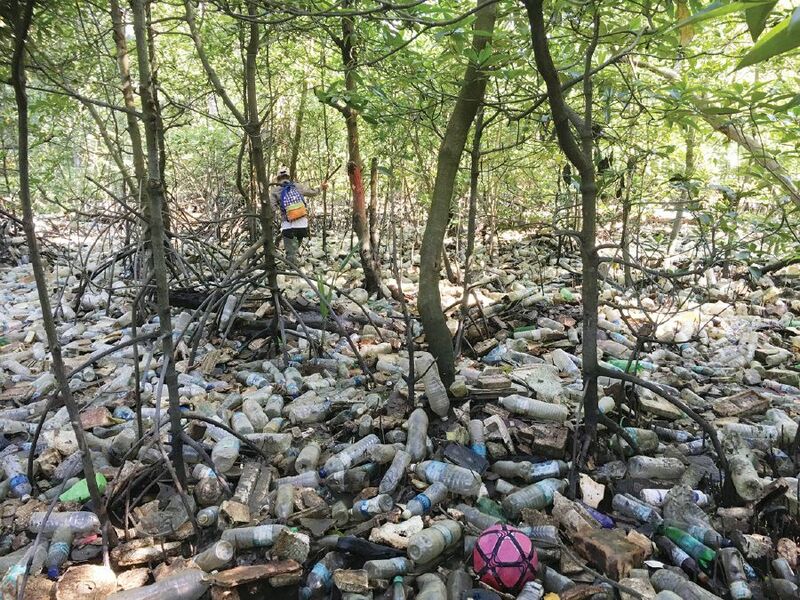 During my recent field trips to various mangrove forests and islands on the west coast of Peninsular Malaysia, there were sightings of plastic litter in the mangroves and on the shores throughout the coast. Accumulated plastic litter can have major negative consequences on mangroves. For instance, they occupy ground space and create unnecessary competition — deterring seedlings to establish and grow, while suffocating and choking the faunal organisms. Plastic litter also affect tidal flushing, causing stress on the ecosystem with increased salinity and chemical deposits. Furthermore, plastic litter could also promote the spread of mosquito- and other pest- and water-related diseases, among others. Marine debris issue is, of course, not a simple one to resolve as it involves trans-boundary movement of litter, but locally, poor management of solid waste especially in coastal villages and towns is found to be the prominent root cause. Some fishing villages are not equipped with a proper refuse centre and a proper waste collection system, while some are without a proper sewerage system. Many mangrove forests are still perceived as the most convenient dumping sites, while some mangrove estuaries are suppressed by the impacts of leachate and overflow garbage from the nearby illegal landfills. It is crucial to note that coastal villages are directly affected by the daily flood and ebb tides. Critically, during spring tides (new moon and full moon), all low lying villages are flooded and the tides will wash away unmanaged litter when ebbing, and contribute further to the marine debris issue. Therefore, a proper waste disposal and management system must be implemented and enforced especially in coastal villages and islands to control plastic litter and marine pollution from affecting the mangroves and other marine and coastal habitats. 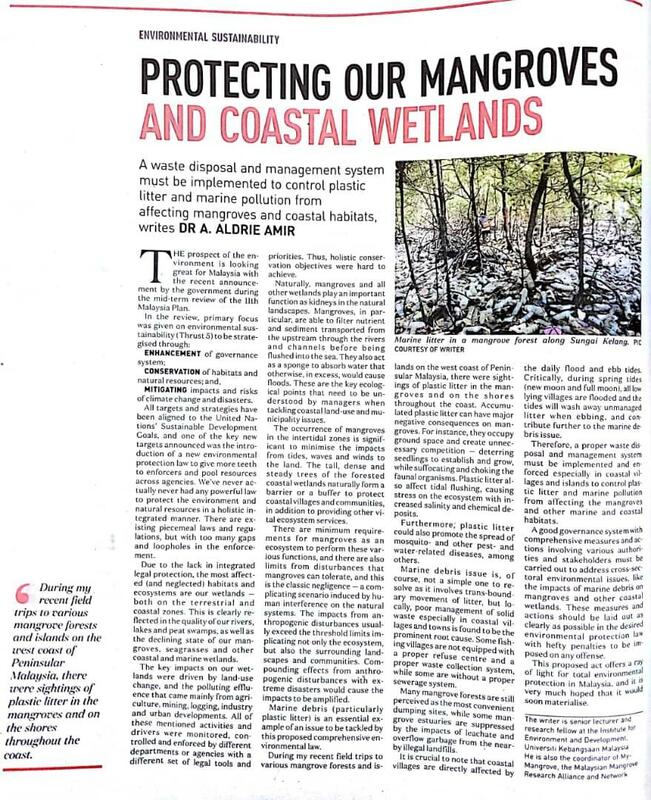 A good governance system with comprehensive measures and actions involving various authorities and stakeholders must be carried out to address cross-sectoral environmental issues, like the impacts of marine debris on mangroves and other coastal wetlands. These measures and actions should be laid out as clearly as possible in the desired environmental protection law with hefty penalties to be imposed on any offense. This proposed act offers a ray of light for total environmental protection in Malaysia, and it is very much hoped that it would soon materialise.